Colin McDermott, VMD, CertAqV, currently practices exotic and aquatic medicine at Mount Laurel Animal Hospital, a 24-hour emergency center in Mount Laurel, New Jersey. After earning his VMD, he completed a 2-year specialty internship in exotic companion animal medicine and surgery at University of Pennsylvania. He was a previous Helen Swearer Fellow in aquatic science and veterinary medicine at the National Aquarium in Washington, D.C., and Baltimore. Many diseases of fish are subtle until the infection or pathologic process is more advanced. Veterinary care is often complicated by owners missing early signs of illness and seeking veterinary care later in the course of disease. A thorough history and husbandry evaluation should be performed prior to examination. Visual clinical signs are generally not pathognomonic for many diseases, and diagnostic testing for definitive identification of disease is required. Skin/mucus cytology, gill biopsy or endoscopic evaluation, culture and susceptibility testing, or biopsy and histopathology should guide appropriate therapeutic choices. Doses and duration of various medications are discussed at length elsewhere.1,2,3 Because of the risk for human exposure through water and the possible dumping of wastewater after therapeutic treatment, judicious use of antibiotics and antiparasitic medication is recommended. The following images offer an overview of several types of fish diseases. The normal appearance of fish can vary greatly. Both scaled and scaleless fish are typically coated in a mucus layer that acts as a natural protection from infection. This protective mucus layer is considered immunologically active4; thus, disruption of this layer and underlying skin can make the fish more susceptible to skin lesions and infection. Hyperemia is caused by vasodilation of capillaries in the epidermal layer of the skin and along the fins and can occur in response to inflammation, infection, or generalized stress. The degree of hyperemia should be noted prior to handling, as handling can artificially worsen hyperemia. 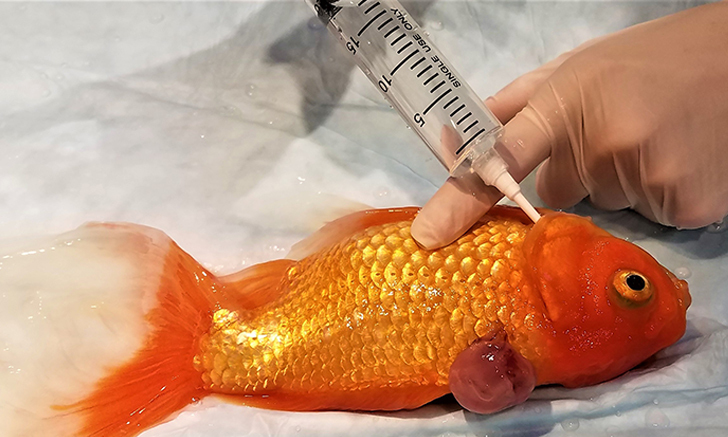 Thus, careful inspection of the fish through the tank or from the water’s surface is recommended prior to catching the fish for any physical examination. Fin rot is the common term for any erosion that destroys the normal architecture of the fins. Fin rot can be associated with infectious (eg, bacterial, fungal, parasitic) or noninfectious (eg, trauma, poor water quality) etiologies. In minor cases, the tissue between rays of the fin may be eroded. In severe cases, infection may reach the base of the fin and expose underlying muscle tissue. Diagnostics should be aimed at identifying the etiology of the underlying infection for proper treatment. The fish with fin rot in Figure 4A can be compared with the healthy fish in Figure 4B. 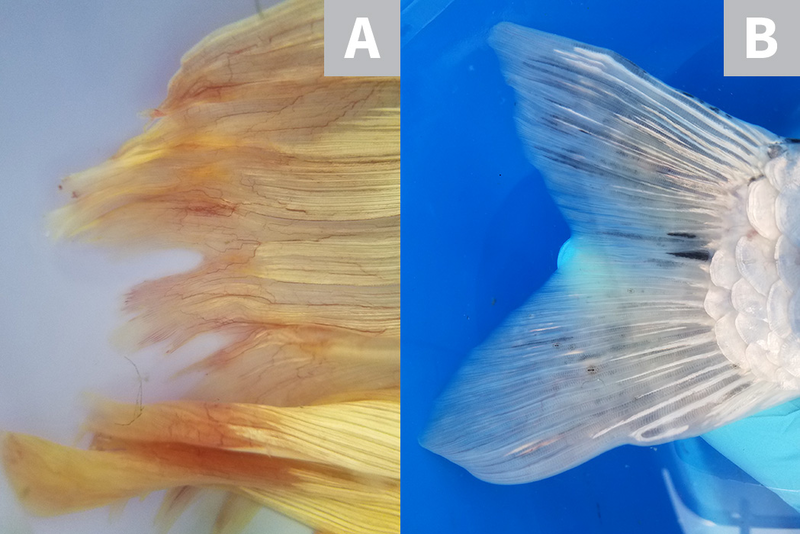 In Figure 4A, fin rot is affecting the fish’s distal tail but not eroding skin or muscle. HLLE refers to erosion and scale loss originating around the eyes and extending caudally down the lateral line. 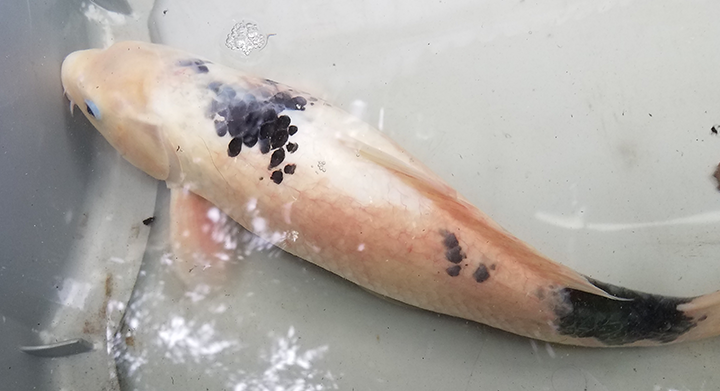 An exact cause of these erosions has not been identified and may be multifaceted, but there is a strong correlation between the use of activated carbon and development of lesions.6 HLLE has been reported in multiple species of freshwater and marine fish. Erosions are rarely fatal but diagnostic testing should be performed to rule out secondary infection. Proper medical management and husbandry correction may stop the progression of these erosions and, in some cases, may cure them. 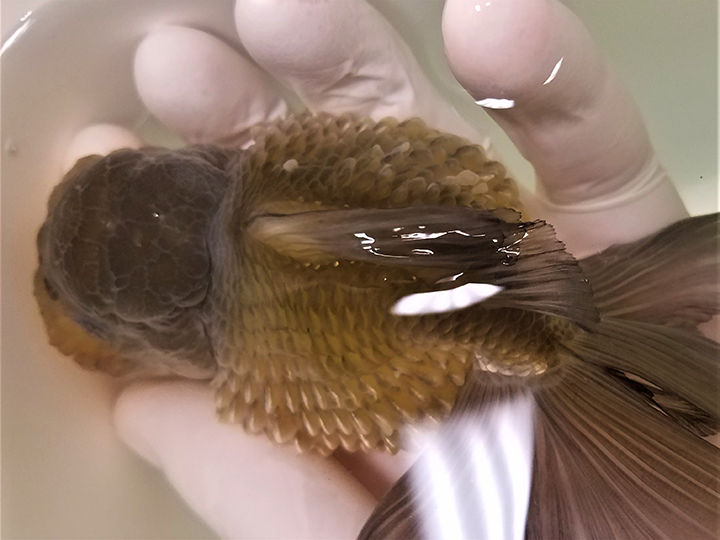 Lepidorthosis, commonly referred to as pine-coning or dropsy, is a common syndrome in many species of freshwater fish. The pine cone-like appearance of the scales occurs when the epidermis becomes edematous, causing the scales to fan out at right angles. This edema is caused by an osmotic imbalance in the fish, which may be caused by disruption of gill function, renal disease, or hepatic disease.7 Treatment is aimed at correcting any environmental issues and identifying the underlying cause of the edema. Several types of neoplasia have been noted in various fish species. 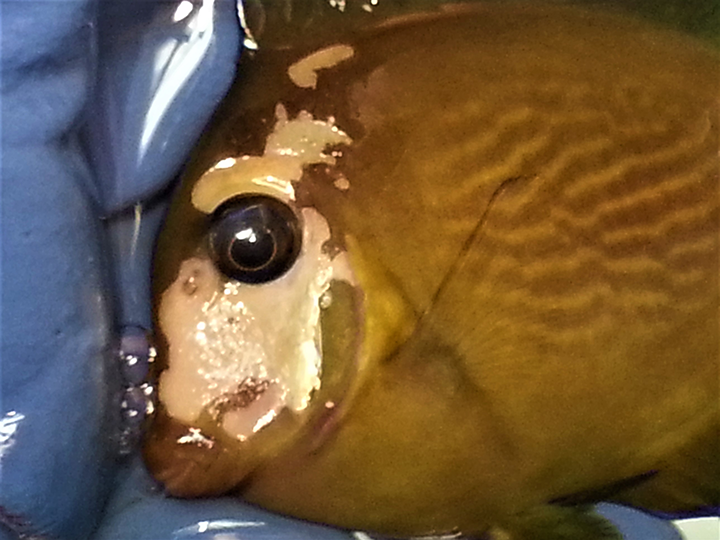 Skin tumors are most commonly presented for veterinary care, as they are more noticeable to fish owners. Skin tumors are generally benign local lesions (eg, papillomas, spindle cell tumors, neurofibromas).8 Neoplasia of the coelomic viscera (eg, hepatobiliary, renal, gonadal) may present as coelomic swelling or bloating. Methods of tumor removal and treatment include surgical excision, cryotherapy, and debridement. Biopsy is recommended for all excised lesions. 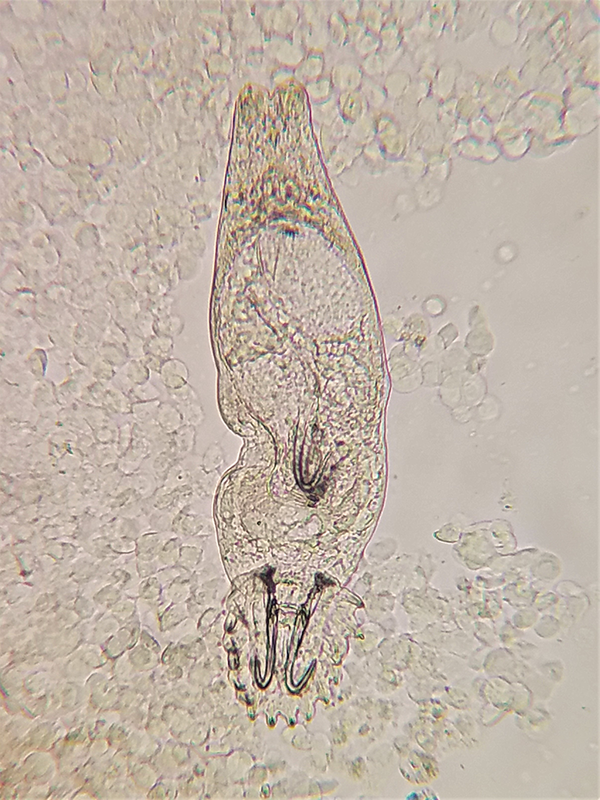 Dactylogyrids are monogenean parasites most commonly found on the gills of freshwater fish. Dactylogyrids are distinguished from gyrodactylids by their distinct eyespots and scalloped head region, visible in Figure 9. The eggs of dactylogyrids are resistant to all known treatments.1 Proper treatment should be performed at regular intervals and aim to kill the parasites after hatching. 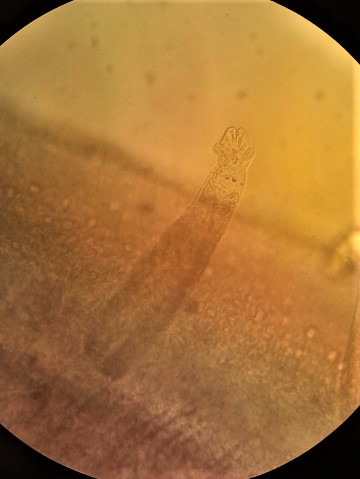 In contrast to dactylogyrids, which are typically found on the gills of freshwater fish, gyrodactylids are monogenean parasites most commonly found on the skin. 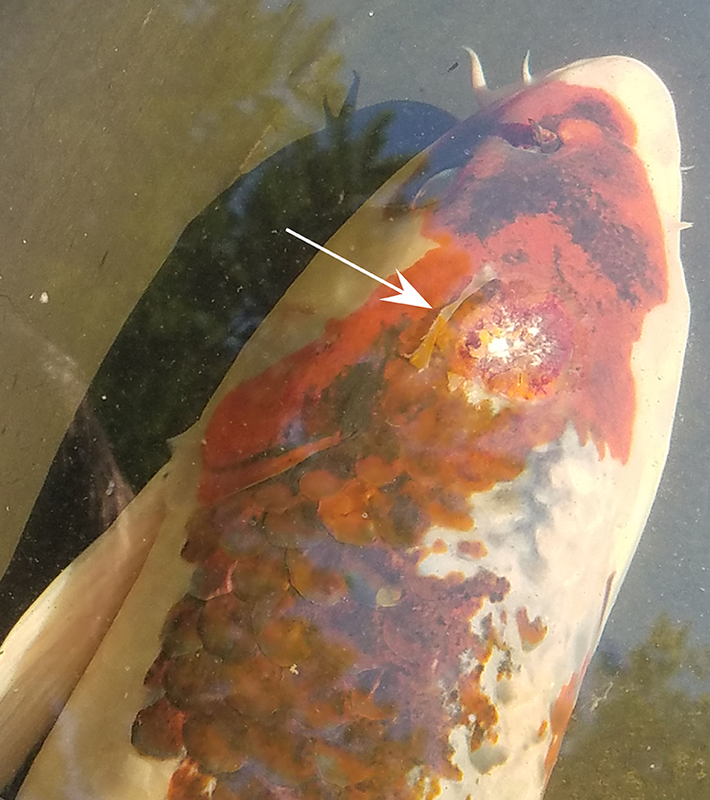 Signs of infection include flashing (ie, rubbing or rapidly scratching against items in the enclosure) or ulceration, but gyrodactylids can also be found on clinically normal fish. Gyrodactylids attach to their host with a large opisthaptor, a hooked adhesive organ, and give birth to live young, which are often visualized as an extra opisthaptor in the uterus of the adult parasite.1 Because there is no resistant egg stage, duration of treatment for gyrodactylids is often shorter than for dactylogyrids (Figure 9). 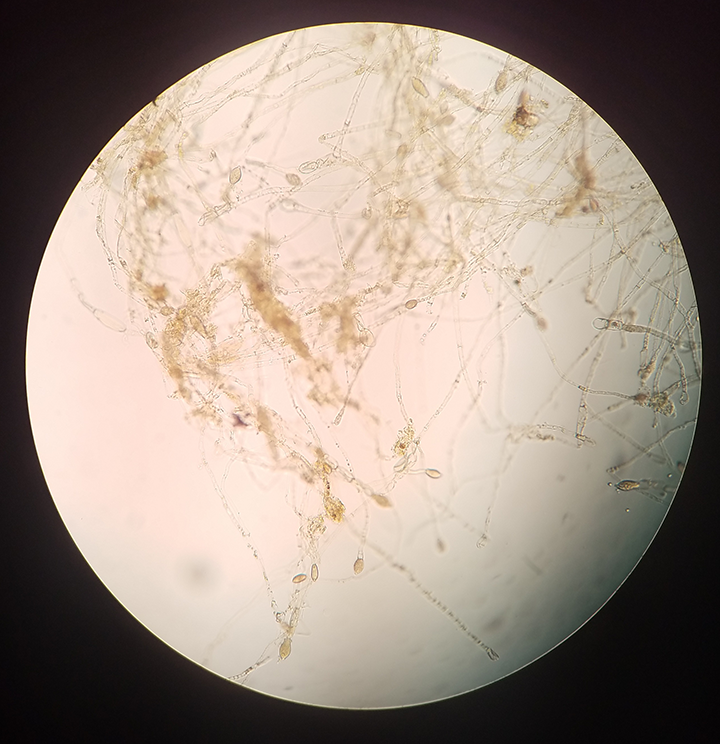 Trichodina are unicellular protistan parasites often found in freshwater and marine fish. They can be found along the skin, gills, or, in some species, in the urogenital tract. In low numbers, these parasites are rarely pathogenic. 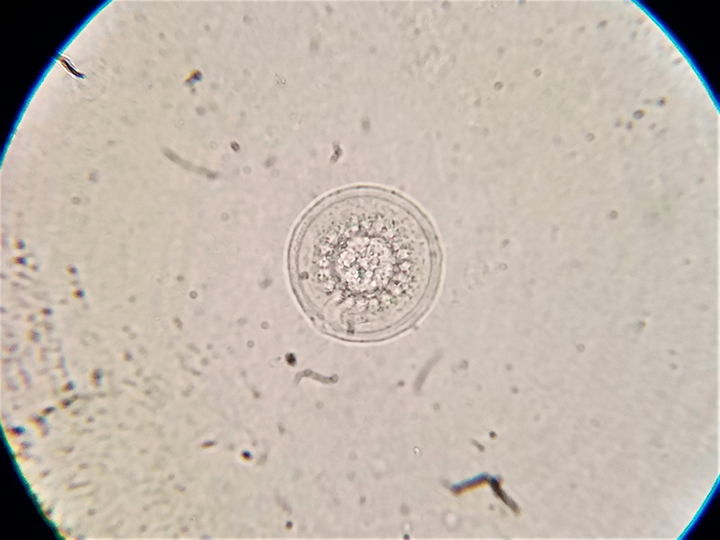 In poor water quality conditions or in the presence of high levels of organic material in the water, these parasites can be present in large enough numbers to cause host morbidity (eg, flashing, ulcerations, thickening to mucous layer producing a bluish or dull appearance).1 Although trichodina are sensitive to some therapies, treatment should be aimed at improving overall water quality. Noga EJ. Fish Disease Diagnosis and Treatment. 2nd ed. Ames, IA: Wiley-Blackwell; 2010. Roberts HE, ed. 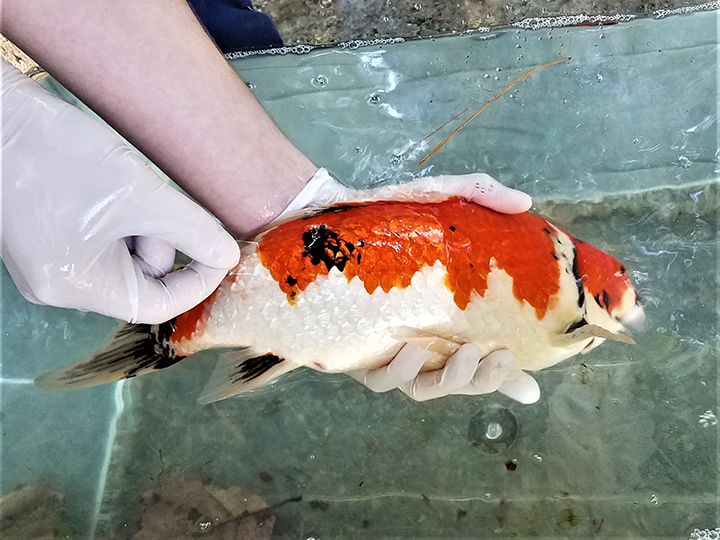 Fundamentals of Ornamental Fish Health. Ames, IA: Wiley-Blackwell; 2009. Lewbart GA. Fish. In: Carpenter JW, Marion CJ, eds. Exotic Animal Formulary. 5th ed. St Louis, MO: Elsevier; 2017:16-52. Salinas I. The mucosal immune system of teleost fish. Biology. 2015;4(3):525-539. Yanong RP. Fungal diseases of fish. Vet Clin Exot Anim. 2003;6(2):377-400. Stamper MA, Kittel MM, Patel EE, Corwin AL. Effects of full-stream carbon filtration on the development of head and lateral line erosion syndrome (HLLES) in ocean surgeon. J Aquat Anim Health. 2011;23(3):111-116. 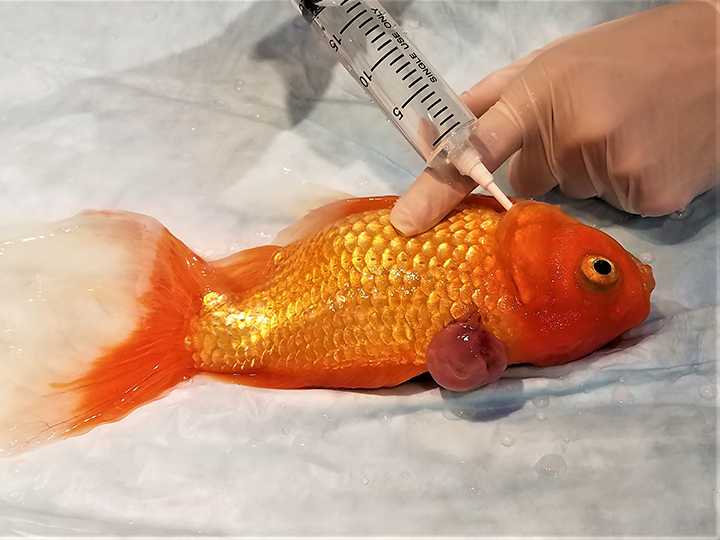 Reavill D. Generalized edema of a lionhead goldfish. In: IAAAM proceedings 1994. https://www.vin.com/doc/?id=3980307. Accessed June 1, 2018. Groff JM. Neoplasia in fishes. Vet Clin North Am Exot Anim Pract. 2004;7(3):705-756.